A family without secrets is rare indeed. People who live in families make every effort to keep certain things concealed from the rest of the world, and at times from each other as well. Things will be lied about, or simply never mentioned. Sometimes family secrets are so deeply buried that they elude the conscious awareness even of those most closely involved. From the involuntary amnesias of repression to the wilful forgetting of matters it might be less than convenient to recall, secrets inhabit the borderlands of memory. When I was a child, a vague sense of my father’s feelings of wartime ‘rootlessness’ was communicated to me by his reluctance to talk about his own childhood, and even to put names to the places where he’d lived. And he in turn was possibly affected by the silences kept by his parents about their own unsettled beginnings, which were marked by death and poverty – particularly in the case of my grandfather. The theory of transgenerational ‘haunting’ (or cryptonomy) described by the psychoanalysts Abraham and Torok, may provide one answer for these silences. They believe that the hidden traumas of previous generations can affect the lives of their descendants, and that this knowledge is passed on through what is hidden or not said, rather than what is implicitly stated. The 2nd World War was certainly an uncanny time in history, being haunted by memories of the previous – and relatively recent – conflict, and would have revived negative memories for those who had lived through that time. It was only when I was older that I began to appreciate the fact that, like many of those born in the latter half of the 19th century, my grandparents had lived through two long periods of war, something which must have impacted on their lives in various ways. Years later when my father returned to visit East Coker (where he was evacuated during the war: see In my Beginning is my End), he was disappointed and saddened by the experience and did not want to talk about it. The lane which led to Burton farm – once a dirt track with one or two cottages – was now graced by a row of detached suburban-style houses, while the original village centre had expanded outwards to swallow other nearby lanes and hamlets. This does not detract from the intact feeling of the place for the modern visitor, but would represent major changes to someone who had waited almost half a century to return. Like his father before him, who did not recognise post-war Brixton, he could not easily reconcile this version of a more ‘sanitised’ East Coker with the one he had kept in his memory. And devoid of the people he had once known, the place might have given off the eerie feeling of being a simulacrum of the village he had once called home. It was around this time that I, perhaps thoughtlessly, gave my father a book detailing the personal childhood experiences of the evacuation (The Day They Took the Children, by Ben Wicks), thinking it would be something in which he might be interested. Later I discovered that he had put it away, unread. The children’s evacuation had exerted a fascination for me ever since I’d watched the 1974 children’s BBC drama Carrie’s War, (based on the book by Nina Bawden), and I had always regarded it as something exciting – almost wishing I could have experienced it for myself, despite the hardships the story portrayed. And in some way my father’s time in Somerset had become entwined with those thoughts of escape and adventure. One thing which happened at the time of the evacuation which I had heard about was the story of the lost toys. Growing up in a household full of practically every plaything I could reasonably wish for, this tale has always seemed especially poignant. Pieced together from shared memories, it concerns the day, relatively early on in the war, when my grandfather brought some of the furniture and belongings from the bombed house in West Norwood down to Somerset, travelling from the railway station in a pony and trap. When the children knew that their father was bringing their cherished possessions from the old house, they were in a great state of excitement at seeing their father and being reunited with their favourite things again. Alas, it was not to be. None of their toys were among the objects on the cart, including my father’s beloved fort and my aunt’s dolls’ house, both of which I believe had been made for them by my grandfather, who had a gift for working with wood. It turned out that Sidney had stored some of their belongings with relatives in Norwood with whom he had eventually quarrelled, and he had never been able to go back to fetch these items. I often wonder what happened to those toys – which were no doubt greatly loved at a time when children had few playthings. I remember once when I was staying with my Scottish grandmother after she had been widowed, and my mother had helped her clear out a cupboard built into the floor of the cloakroom in the hall (or lobby press, as we called it). This had always been my grandfather’s domain (being dark and dusty and full of spiders), and when my mother took it upon herself to rummage about in the space she found a cornucopia of old toys, many of which she’d been bequeathed from older relatives, including a china doll bought in France during WW1, a metal spinning top, and a couple of strange wooden objects we had to be taught how to use! 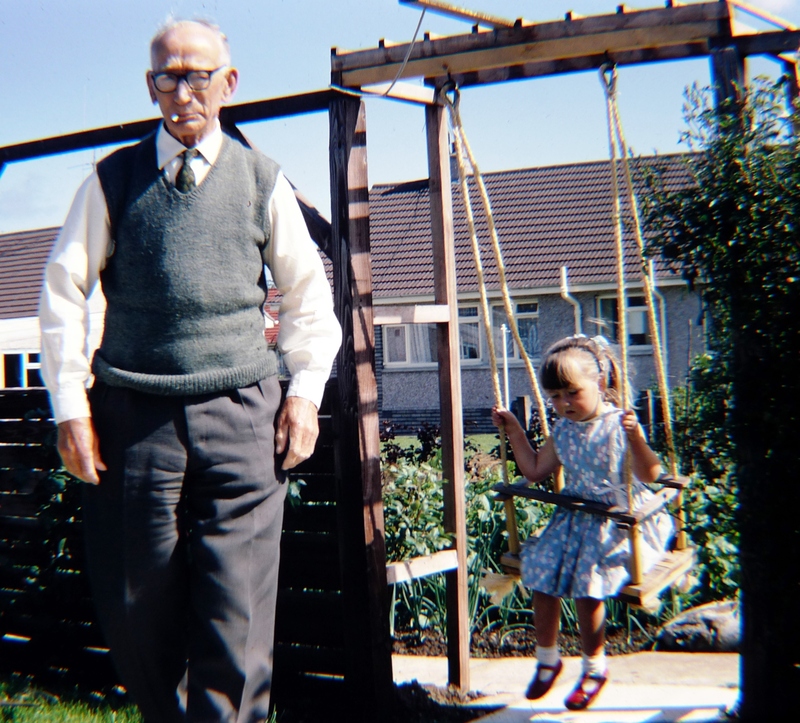 This also spurred my Scottish grandmother to reminisce about her favourite childhood games – including the metal hoops that she and her siblings played with in the street (which seem to be the ubiquitous image of turn of the century childhood). I vowed then that I would never let my favourite childhood toys languish in an attic or basement space. So it is little wonder that the one possession my father still had from his childhood was tucked away at the back of his section in my parents’ wardrobe, thus taking on a magical significance in my eyes. 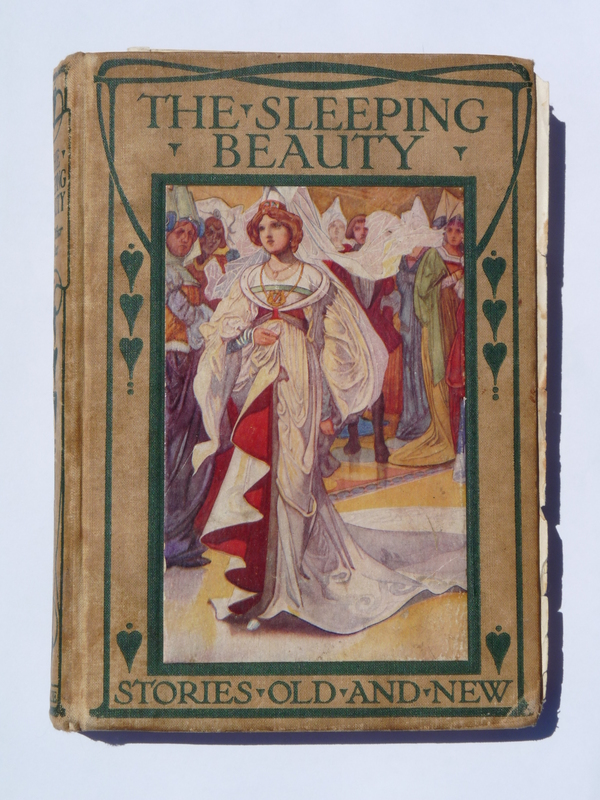 It was a book of fairy tales which had been given to him for Good Work and Conduct in 1936 while a pupil at Crawford Road School, situated round the corner from the house in Denmark Rd. It seemed strange to me then for an adult to keep a children’s book hidden away like that, and the moment our parents’ backs were turned my sister and I used to sneak the book out of the wardrobe, revisiting our particular favourite stories again and again. We enjoyed being spooked by the graphic descriptions of evil deeds and the accompanying evocative line drawings. Blue Beard and his Seven Wives was one story of which I never tired – and I would reread with relish the descriptions of the forbidden closet where Blue Beard’s ex-wives’ bodies were plastered against the walls. And as children we believed that the book had been hidden in order to protect us from reading about such horrific events. Eventually it ended up in the hall bookcase – the pages had been so badly smeared with grease from our cake-eating fingers that there was little point in keeping it away from us any longer. But we were never admonished for ‘defacing’ the book (I had even scribbled over the dedication), whose first owner had kept in immaculate condition. Maybe there was a sense of liberation from the past when two living and irreverent children found joy anew in the gruesome tales? Thankfully the book survived intact, in part due to its special status, while its counterpart (my mother’s fairy tale book) at our McKay grandparents’ house did not. This book was possibly my father’s link to his stable pre-war childhood – and had probably been a prized possession in a house that had few books (even as adults my parents never collected books in the same way my sister and I do, although we were certainly given plenty as children). This period in my father’s childhood seemed to have created the strongest memories, many of which I only know through my mother. I learned that the family had once had a pet dog called Ronnie, and had kept hens for a while; that Sidney rose early on cold mornings to light the fire before the family stirred, and that he could turn his hand to almost anything: he grew vegetables, made things from wood, and knitted intricate patterned woollens (a skill he had learned in the army). For her part, my grandmother, Edith, was a very motherly woman who fussed over her brood to an extent that my father eventually found claustrophobic: the very fact that she kept them all together during the war is testament to her desire to give them a continued sense of family. In short, both my grandparents dedicated themselves to raising their three children, trying (perhaps even unconsciously) to give them the safe childhood that they themselves had lacked. We know already that Edith lost her father at a relatively young age, and had also to move from her childhood home to less salubrious surroundings (see I Remember, I Remember), but what of Sidney? When I was doing my initial research in those far-away, pre-internet days I only had access to the census up until 1891, but once I was able to continue my search I had both the 1901 and 1911 census at my disposal. This data in turn threw up more avenues of research in the form of birth, marriages and death certificates, which in turn created more leads (such is the nature of genealogical research). Parish records – particularly for the London area – were now on-line, and school and workhouse registers could be viewed at the London Metropolitan Archives – before many of them eventually also became digitalised. And so it was that I was able to find out more about my grandfather’s beginnings. It seems that Sidney Skelton was born on February 12th 1892 in part of a multi-occupancy house which the family rented at 78, Cator Street in Peckham (near the Old Kent Road and the now long-gone Surrey Canal). He was the fifth child to a working-class couple in their early thirties – his father Arthur was a journeyman bootmaker. (This meant he had served an apprenticeship but had not reached the level of master where he could hire apprentices). Arthur Skelton had named his son after his younger brother – who had inadvertently also been christened Arthur (!) but was known as Sidney. From the various records I consulted, the Skeltons appear to have led a precarious existence: as their family grew, Arthur and his wife Elizabeth (neé Holton) were constantly moving around Lambeth in the search for cheaper rents and employment (often renting two rooms for the whole family). In contrast to most of their siblings, Arthur and Elizabeth seem to have been a rather feckless pair. They had met as teenagers in Kennington where they’d lived in adjoining streets, and married soon after, when Elizabeth was six month’s pregnant with their first child, Arthur jnr. Elizabeth had no education and was unable to write, while Arthur snr. had grown up not really knowing his father, who had been 60 when he was born. Arthur snr. was, like his own son Sidney was to be, also the fifth child of six: in his case he was the product of a long-term relationship between a middle-aged widower and a teenage single mother. His mother (who was in her thirties when widowed by her 67 year old husband of 3 years) eventually had to go out to work in order to support the family, and Arthur left school at the age of 10 (as was normal in those days) and started work as a milk boy. 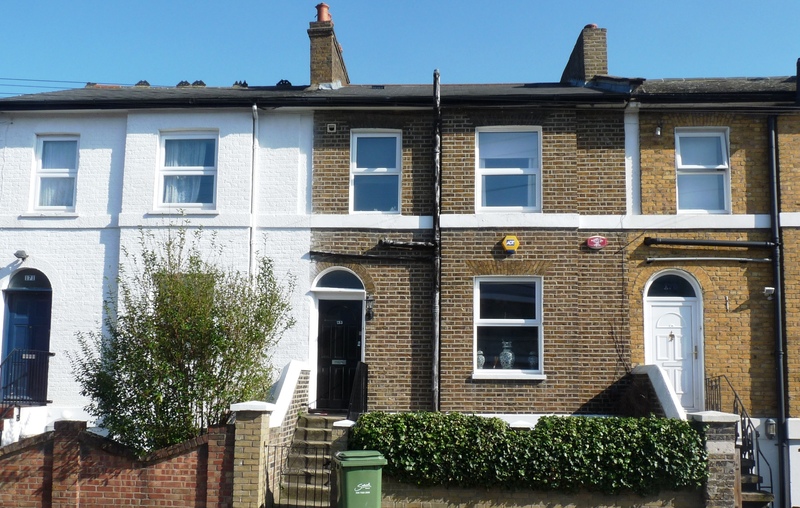 In June 1895, when my grandfather was three, the family (who had already moved several times since his birth) were now living in Daniels Rd, Nunhead opposite the famous cemetery. At around this time Charles Booth described the street (which was built in 1863) as 2 story houses, flush with sidewalk; broken windows occasional; numerous and noisy children: a low standard street; difficult to say what the people do for a living, but some work as labourers in the adjacent cemetery, others as builders’ labourers etc. Broken windows seemed to be a relatively common feature of the area – Booth’s notes for the neighbouring Nunhead Grove mention that A small boys’ battle was raging while we were in this street, with stones flying about unpleasantly, but apparently no damage done. One of the common complaints of this section is that of boys who break a window instead of cutting an enemy’s eye open. It was while living at Nunhead that Sidney’s mother Elizabeth was admitted to St Thomas’s Hospital with Cirrhosis of the Liver and Jaundice. She died on the charity ward there, several weeks later. We do not know what caused this illness – whether she had contracted a hepatitis infection or had been imbibing to escape the privations of her life. Unfortunately, the impressive looking, red leather Death Book from St Thomas’s, which I consulted in the LMA, did not give me any more details. Soon after his mother died, little Sidney (who even as an old man gave the impression that he had never quite developed into his full height) was sent to the local school with his siblings – possibly because there was no one now at home to look after him. However, the following year (1896) Arthur married a neighbouring widow (Harriet Pushman) who had several children of her own, necessitating yet another house move. What really saddened me was when I discovered that some of Sidney’s experiences had actually closely mirrored (albeit in different circumstances) one set of his grandchildren, who, over seventy years later, were themselves left motherless at a vulnerable age. This made me curious as to why he had never told any of the family about the loss of his own mother. Had he in fact even remembered the event? When it came to his grandchildren, Sidney played a major role in helping them and their father come to terms with their situation – but he was also adamant that his grandson should learn to stand on his own two feet. With hindsight it would seem that (whether consciously or not) Sidney wanted him to deal with his loss in the same stoical way as he had no doubt done, having had little choice in the matter. I often wonder what it would have been like for such a young child to have suddenly gained not only a new step-mother, but also a collection of step-siblings near to him in age. (His oldest brother, Arthur, eventually went on to marry his step-sister, Harriet, both of whom were named after their respective parents). There is, however, a sad post-script to this story. Several months ago I came across the records of the baptism of another little boy who was born to an Arthur and Elizabeth Skelton of Daniels Rd in Nunhead. I would seem that he was ‘one of ours’. Yet why had I never heard of this child? My father’s family had always assumed that Sidney was the last of the brood. But it turned out that Elizabeth had actually given birth to one more child at the age of 35, a year before she succumbed to her illness. A boy called Frederick Edward. So what had become of him? Some more research soon revealed the horrible truth: he had died alongside his mother at St. Thomas’s from Rickets (3 months) and Marasmus (in other words, severe malnutrition) at the age of 7 months. It seemed that no-one in the family had ever known of this little fellow’s existence: an infant who would not have been allowed to lose his life in the London of today. It is perhaps the death of Frederick which makes me (rightly or wrongly) judge Arthur and Elizabeth harshly. Was Elizabeth an alcoholic who was unable to care properly for her children? Was Arthur already in a relationship with Harriet Pushman before Elizabeth’s demise? Were they actually both unfit to be parents? Some things we will never know, and it is perhaps better so. But the idea that the repressed memory of such events may find their way down through the generations in different ways is certainly appealing. And there is yet one more twist to this tale. The night my grandfather died (and before we received the news in Scotland, as we had no telephone at the time) my father – who was by no means given to flights of fancy – awoke to find his father standing at the bottom of the bed, smoothing down the coverlet. It seems that even as Sidney was leaving this world, he was trying to let his children know that he still wanted to take care of them. This entry was posted in East Coker, Houses and tagged Cator Street, Daniels Road on February 1, 2016 by The Incidental Genealogist.